Automatic Pool Covers: How Do They Work? An automatic pool cover is a great way to keep your pool clean without the hassle. Cleaning your pool can be a real hassle, and even automatic pool cleaners need a little help. Covering your pool whenever you aren’t using it is the ideal way to keep it clean, but covering and uncovering your pool is a chore. Adding an automatic pool cover will prolong the life of your filter and extend the life of your pool by keeping it clean. 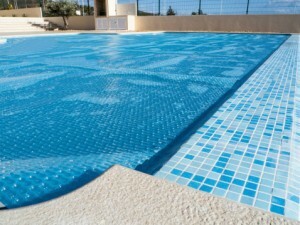 An automatic pool cover is made from a reinforced vinyl fabric that’s run between tracks on either side of the pool. On one end of the pool is a roller with an electric motor that runs the cover in and out. Although it is recommended, automatic covers don’t have to be installed when your pool is built. They can be retrofitted with the track built into your pool deck inside of on the side of the pool. This method is used to cover pools of irregular shapes, too. Since the vinyl material covers are made from traps heat so well, a pool cover helps keep your pool warmer during the early and late months of the season. If you have pets or young children, an automatic pool cover is a great way to make sure no one enters the pool without you knowing. Plus, an automatic pool cover can help keep unwanted swimmers out of your pool while you’re away. This entry was posted on Friday, July 15th, 2016 at 9:46 am. Both comments and pings are currently closed.